On July 15 the Regional Rail Link (RRL) took a significant step towards completion when the new pair of tracks from Sunshine to Southern Cross was used for the first time by Ballarat and Bendigo trains. 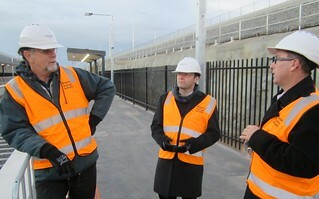 Just before the new section opened, the PTUA’s Tony Morton, Daniel Bowen and Paul Westcott were given an escorted tour of the whole project by RRL Authority CEO, Corey Hannett. The huge scale of the undertaking was impressive and is difficult to sum up in a brief report. In most ways it is larger than the Melbourne Underground Loop project of the 1970s. With a couple of exceptions, the RRL Authority has done an outstanding job of delivering the unfortunately flawed scheme that was handed to it. The work is certain to be finished about a year ahead of schedule, and the consequent savings have offset the cost of some notable improvements over what was originally proposed. One improvement is the provision of an additional bridge over Dudley Street, brushing the wall of Festival Hall, which ensures complete separation of suburban and regional trains in that section. Another is the two grade separations at Sunshine involving Anderson Road. On the newly-opened section, apart from the construction of a new pair of tracks for regional trains, which necessitated the demolition of a number of houses in Footscray, four suburban stations have been totally or partly reconstructed, the erection of many kilometres of noise walls has almost been completed, and a bike path has been provided alongside the rail reserve. Completely new bridges have replaced those taking Nicholson and Albert streets across both the existing and new lines in Footscray. The RRL tracks across the Maribyrnong River are on a new bridge which is a kilometre long, thereby avoiding problems caused by silty ground on the Footscray side. The signalling on the existing Footscray–Sunshine tracks has been completely renewed. One of the flaws still existing from the time the project was announced in 2008 is the failure to provide platforms at North Melbourne on the new RRL tracks, even though they run just behind the station. Although it’s quite possible to slew the two new tracks slightly to fit a new island platform between them, it should have been done as part of the scheme. As well as the provision of two extra platforms and associated buildings at Footscray station (incorporating the famed donut seller), the overbridge has been largely reconstructed and additional shelters put on existing platforms. The century-old parts of the station are being extensively renovated, with extensive termite damage being rectified and the main roofs to be renewed with Welsh slate. The new station buildings at West Footscray and Sunshine certainly dominate the landscape, partly due to the need to make them fully accessible, but a lot of thought has gone into the design and the materials used. Nevertheless, the PTUA team was able to point out a few minor problems that Corey Hannett photographed for attention. Tracklaying on the “greenfields” section of the project from Deer Park West to Manor has been completed, including the 12 road-rail grade separations. The two new stations on that section, at Tarneit and Wyndham Vale, only require final fitting out. As a result of local concerns about train noise, the tracks though Wyndham Vale station have been sunk into a massive cutting, two kilometres long and up to nine metres deep, through solid basalt. That means Wyndham Vale station is arguably the most attractive on the project because the buildings sit low in the landscape, only needing to be of one storey. A “consolidation train”, made up of about 15 loaded ballast wagons with a locomotive at each end, was running from one end to the other about 20 times a day to settle the track. Ironically, the RRL Authority had received complaints from some Wyndham Vale residents about the resultant noise, despite the costly cutting provided! Another major flaw in the original RRL project is that Geelong line trains have be both regional and suburban trains on the “Tarneit bypass” because they will provide the only service on that section, which is not electrified. Therefore it was good to note that a turn-back facility has been provided between the two tracks beyond Wyndham Vale station, which will allow “short starters” to operate from there. That means that a suburban-only service could be run to Tarneit and Wyndham Vale stations if it was approved. The bypass of Werribee station by Geelong trains is another fundamental flaw. Nothing has been done to provide the line curving back to Werribee station from Wyndham Vale, as mooted in the 2008 Eddington Report. So the present convenient cross-platform transfer to and from Geelong trains at Werribee will be replaced by a vastly inferior bus connection from Wyndham Vale station. A disappointing aspect of the project as built is that the junction at Manor (West Werribee) between the existing direct line and the RRL Tarneit diversion has been configured so that train speeds on the direct line, which were increased to 160km/h by the Regional Fast Rail Project 10 years ago, have been reduced to 85km/h. There is no reason why the design of the junction should have created that restriction. The PTUA is most grateful to Corey Hannett for giving up the whole of a Saturday afternoon to provide an informative and insightful look at the huge project.